Anthurium plowmanii Croat, Candollea 42(2): 811-813. 1987. Type locale: Brazil, Amazonas: Mpo. Manaus, Chacaras de Taruma. 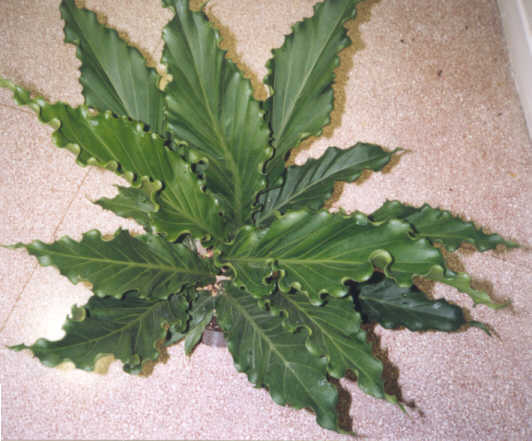 Sectional Placement: Anthurium plowmanii is a member of section Pachyneurium. Description: For a detailed description and citations please click here. Notes: As with most 'birdsnest' types, Anth. plowmanii is of easy culture and withstands indoor growing conditions well. This particular species, though, grows to be quite large, much too large for most residential interiors and many greenhouses. The cultivar "Fruffles", pictured here, is seedling grown from parents selected for ruffled edges and compact growth. Anth. plowmanii is available an easy to grow. Just as long as you have the space!